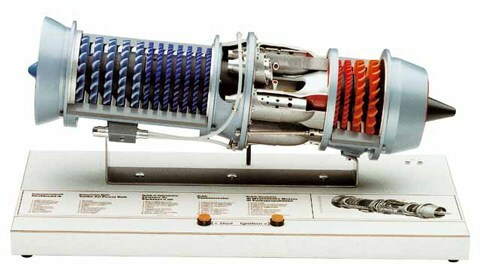 This super-model of a modern two-wave turbine shows in detail the construction and the operating system of such a motor. Low-pressure and high-pressure compressor, low-pressure and high-pressure turbine are readily recognisable, as also are the combustion chambers with the injection nozzles and starting plugs. These can be readily seen thanks to the section cut housing. The turbines can be set in motion with the built-in electro-motor. This cutaway model is carefully sectioned for training purposes, professionally painted with different colours to better differentiate the various parts.